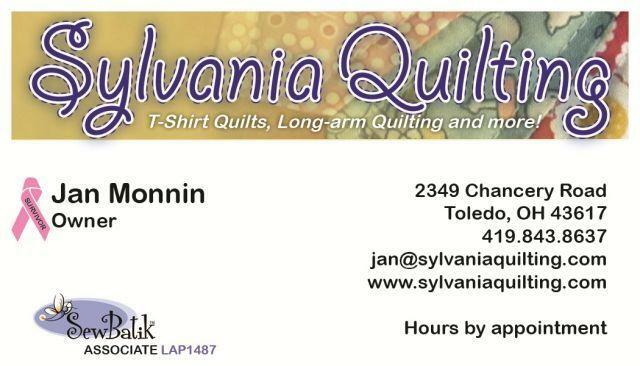 Welcome Friends to Sylvania Quilting! We are here to provide you with affordable and professional quality machine quilting and custom made-to-order quilts. As a small business, we are dedicated to serving the Sylvania, Toledo, and surrounding communities. Therefore, we do not accept any mail orders. Please also know that each quilt is custom made to order by our owner. So there may be a several month wait. It is our goal that each quilt be made and so carefully crafted that it will last for generations. What is a Memorial Quilt? Memorial quilts are quilts made out of a loved one's clothing. After one we love has passed away, most often their clothing is donated. Turning them into quilts is a way to save, treasure and celebrate their memory. These quilts are most often made out of t-shirts, dress shirts, polo shirts, fleece shirts, sweatshirts, flannel pajama pants, flannel shirts. We can help you transform a box of clothing that was going to be thrown away or donated into a very special keepsake for you and your family that will last a lifetime. (Note: we cannot work with jeans). This is a 3x4 t-shirt quilt made for a gal's father who passed away who was a runner. This is a 3x4 t-shirt quilt. This quilt was made from a gal's father out of his various shirts and flannel pajama pants. The entire quilt was made out of randomly placed 7" squares cut from his clothes. This is a 7x9 memorial quilt. please visit our memorial t-shirt quilt gallery page or our memorial clothing quilt gallery page). Our memorial quilts are a better value for our clients. How are we different? We can do up to a full 16 inch square from your clothing. If it's a t-shirt, this allows the entire logo to be on your quilt, not just a portion of it. We are a local Toledo area company. So when we consult with you about your t-shirt quilt in person, you know who you are dealing with. You don't have to worry about sending your t-shirts off to some internet website and wonder if you'll ever see them or your money again. Wash all clothing before bringing them to your first appointment. Do NOT use fabric softener or dryer sheets. We can quilt many different fabrics that are in t-shirts - Shiny, plastic-y logos, netting, sweatshirts, fleece. We can quilt many different types of fabric - cotton, shiny athletic shirts, fleece, sweatshirts, heavy cotton polo shirts, and flannel. Note about jeans: we cannot use jeans in our quilted quilts. finished size of quilt 56x74" 56x92" 74x92" 92x110"
nice couch, or throw size. tshirt quilt:- with 2 inch sashing all the way around or no sashing with a 5" border. $17 for Queen, $19 for King. Prices above do not include sales tax. Sales tax will be charged at the time of the final payment. Please call or email us, using the information at the bottom of this page, or from the contact page. We will answer any questions you might have about your t-shirts and our finished product. We require a 50% deposit upon receipt of your t-shirts and before any work will begin.